SOOOO MUCH SPACE! 5 Level home with all 5 levels finished nestled onto ~1/3 acre lot overlooking a pond. ~4,300 SF! Two-Story Foyer opens to a Vaulted Great Room. Fully applianced Kitchen has wrap around maple cabinets & walks out to a private patio. 1st Floor Den/5th BR. Master Suite (on its own level) has vaulted ceilings, 6 panel solid doors & whirlpool Bath. Loft overlooks the Great Room. Finished mid-level has Theatre/Game Room & Full Bath. Newly finished Basement has 2 Recreation areas & Kitchen (perfect In-Law/Teen Suite). Some solid 6 panel doors and many extras! 4 BRs & 3.5 Baths. 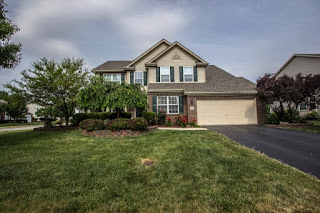 Olentangy Schools (Per sellers: The school bus has stopped in front of the home for the past 15 years). Only $384,900! Call DeLena today!